After the ‘Rhodes Must Fall’ movement, South Africans are pretty clued up on the power of the statue. 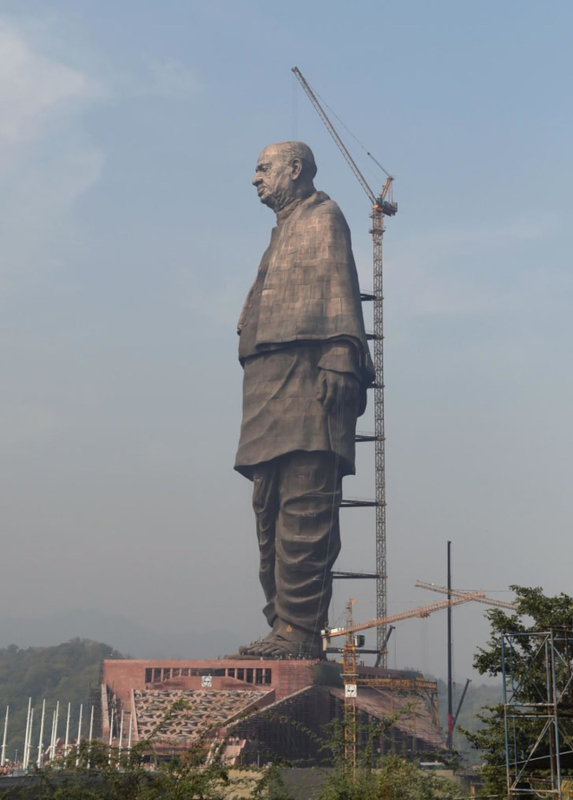 Now, India is set to break records as they prepare to unveil the world’s tallest statue, a towering monument to Sardar Vallabhbhai Patel (below), a popular political and social leader, who was part of the freedom struggle that led to India’s independence from British colonial rule in 1947. 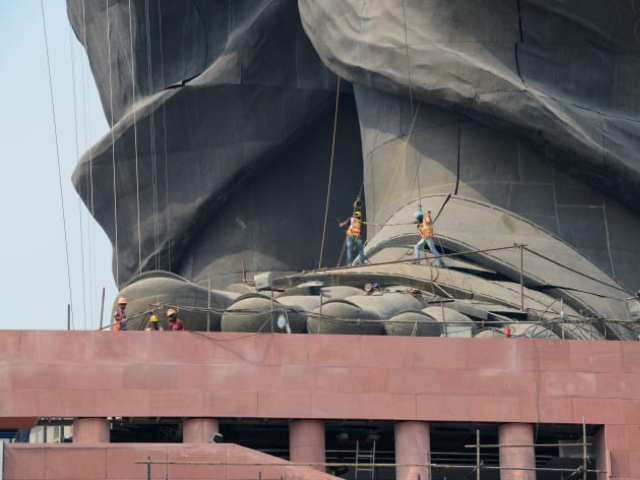 Looming 182 meters (597 feet) above the Narmada River in the western Indian state of Gujarat, the statue is set to be unveiled on October 31, revealing a figure molded from approximately 1,850 metric tons of bronze. “In the world, people talk about America’s Statue of Liberty. We want to make a statue of Sardar Patel at twice the size of the statue of Liberty,” said Prime Minister Narendra Modi in 2013. The Statue of Liberty is 93 meters high, including its pedestal. 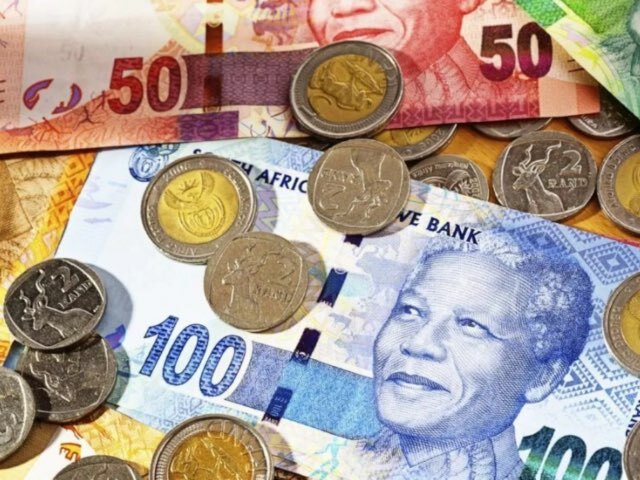 The statue is estimated to cost over $410 million (that’s roughly R6 billion). The committee overseeing the construction called for public donations of money, and donations of iron from farmers. 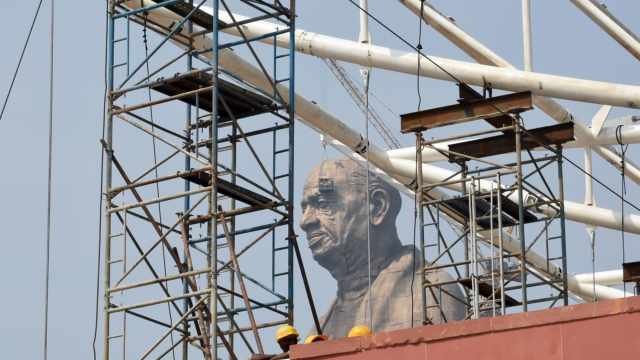 Images show Indian workers putting the final touches on the statue of Patel, who’s wearing a shirt, shawl and loincloth with detailed folds. 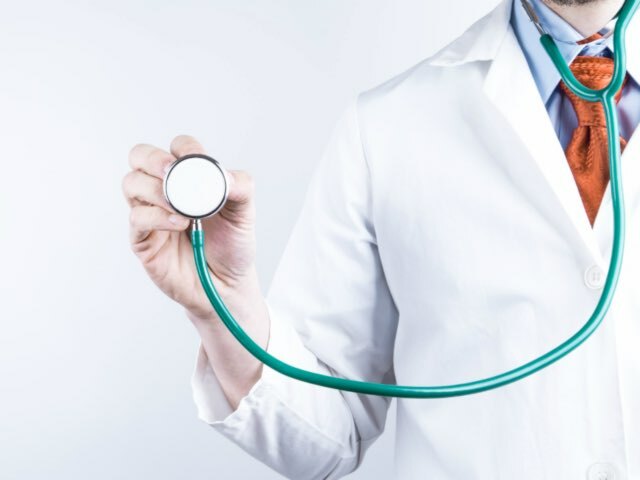 Promoted as a dream that Modi is keen to fulfill in his first term as Prime Minister, the project includes a museum, research and entertainment center. A 3-star hotel has been built in a complex nearby. 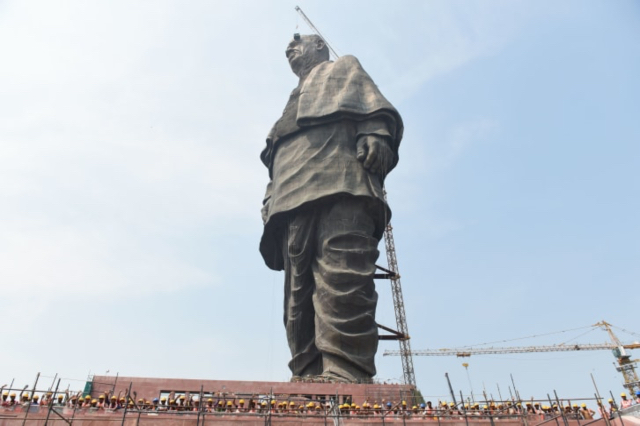 Not everyone is welcoming the massive statue, and critics of Modi see the statue as part of an effort to appropriate a popular national figure. Not unlike the way that political parties in South Africa often evoke the name of Nelson Mandela, when it suits their immediate political needs. Patel was a member of the Congress Party, which now sits in opposition in India’s parliament. 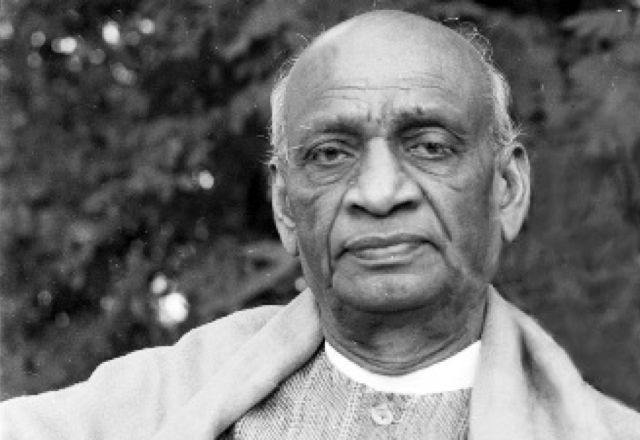 Best known for his role in India’s non-violent struggle to free itself from British rule, he became the country’s first deputy prime minister and home minister after independence in a government headed by Jawaharlal Nehru, India’s first prime minister. Patel was central to the effort to merge small princely states into a unified independent India — and his success there made him a lasting nationalist symbol. 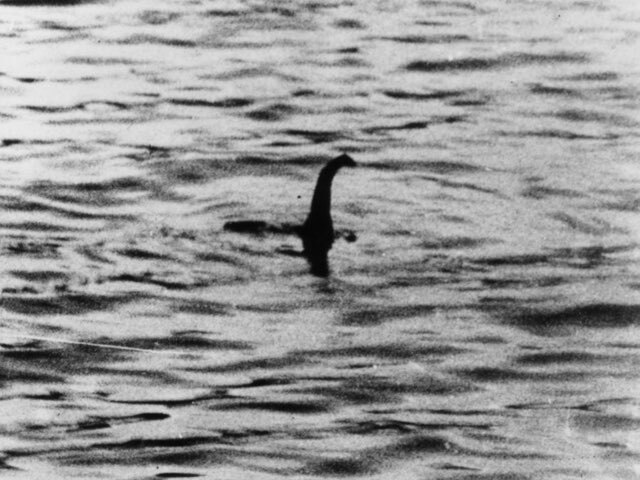 When the statue is unveiled it will be recognised as the tallest in the world – but not for long. A new statue dedicated to a famous Maharashtrian warrior, Shivaji, is being built in the Arabian ocean, just off the coast of Mumbai. Set to reach a height of 212 meters, this new statue could upstage Modi’s dream project. Looks like one to add to the sightseeing bucket list when travelling to India.